I collect leaf mines, galls, etc. in standard insect vials (plastic, 9- or 15-dram). If you go looking for these on BioQuip, they're referred to as "plastic tubes" (if anyone has suggestions of other places to buy these, I'd be happy to add them here). I use a Sharpie pen to write the date, location, and host plant on the lid; this is easily washed off later with alcohol or soap and water when I want to reuse the vial for something else. These vials do a good job of retaining the humidity from the leaves, and often nothing more than this needs to be done for a leafminer to complete its development. There is plenty of air in there for an insect to breathe, so no need to punch holes or anything like that. If the leaves (or other host material) are too large to fit in a vial, I put them in a jar or a Ziploc type bag, but if possible it?s best not to complete rearings in bags because adult insects are likely to injure themselves when they emerge (for instance, moths rub off their wing scales, or other insects may deform their wings by cramming themselves into a tight corner). Some leafminers pupate in the leaves, and in this case you can just wait until the adult emerges. If the leaf starts to dry out (or to prevent a leaf from drying out), I crumple up a square of toilet paper, stuff it in the bottom of the vial, and add a squirt or two of water from an eyedropper. A plastic bag can similarly be humidified with a lightly dampened, folded-up paper towel. 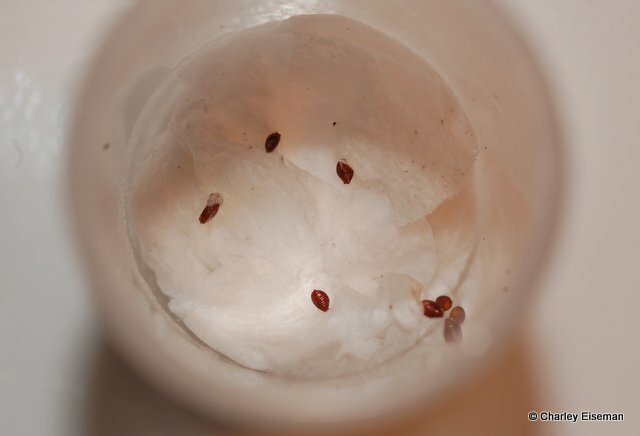 For agromyzid flies and certain other things that exit the plant material before pupating, I move the pupae or puparia to a fresh vial with a fresh piece of moistened, crumpled toilet paper. I move puparia from one container to another using a fine-pointed paintbrush; before picking up each one I dip the paintbrush in water. If the larva has spun a cocoon on the vial itself, I leave it in place, removing the plant material to prevent mold and then adding the tissue paper if there wasn't some already. A vial is optimally humid when you can see the slightest amount of fogging on the sides. The vial in the above photo is excessively humid. I use a paper towel to wipe excess moisture from the sides of vials; otherwise there is a risk of the newly emerged adult getting stuck in a water droplet and either drowning or not having its wings expand properly. In the photo below, we're looking down into the same vial, which contains six puparia of the buckeye-mining agromyzid. I check vials once a day to see if anything has emerged or if any humidity or mold control is needed. Many leafminers will emerge as adults within a month or so. These buckeye flies do not emerge until the following spring, and the same is true of the hackberry gall fly (Cecidomyiaceltis deserta) and a number of other insects whose larvae are only active in spring. Species with this kind of life cycle obviously take a little more dedication to rear, and it's important to check the vials regularly and add drops of water if the tissue starts to dry out. If the tissue starts to get moldy, I transfer the puparia to a fresh vial with a fresh piece of tissue. Erik van Nieukerken uses moss instead of tissue for rearing nepticulids, heliozelids, and other moths. This reduces the mold problem (I'm told), but has the disadvantage of potentially introducing predators, pathogens, or other contaminants to the vial. 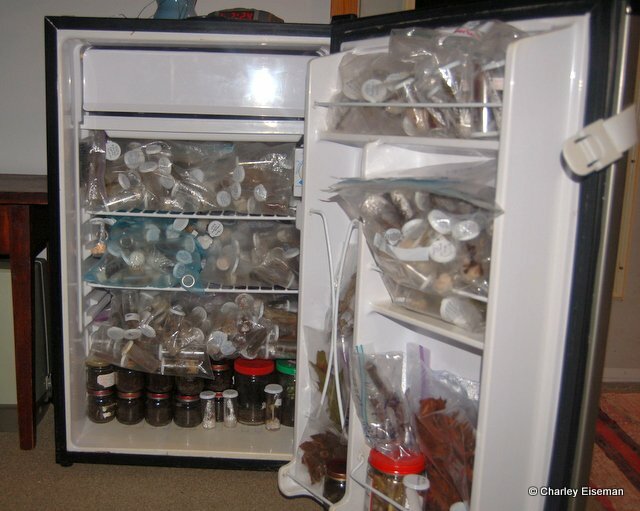 The fridge is mostly filled with vials in gallon Ziploc bags. In the lower half of the door, you can see a few bags containing larger leaves. On the bottom shelf of the fridge are baby food jars and peanut butter jars containing soil. This brings me to my rearing method for insects other than agromyzid flies that exit their mines or galls to pupate (or are free-living to begin with). Some insects spin a cocoon aboveground, and these I handle in the same way as agromyzid flies. Others (e.g. eriocraniid moths, gall midges, anthomyiid flies, most sawflies, and many weevils and chrysomelid beetles) burrow into soil to pupate. 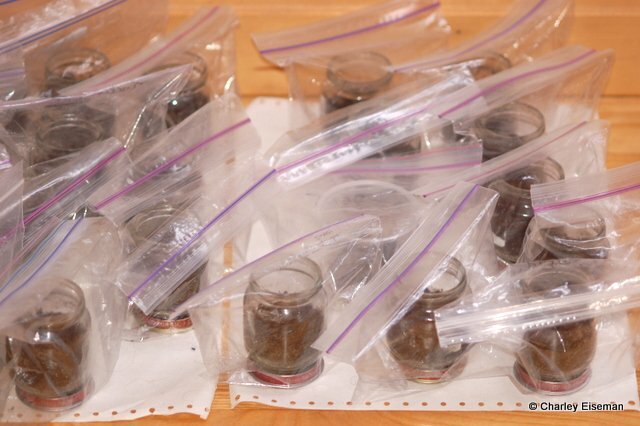 For these, I put a moistened 50/50 mixture of peat and sand in a jar, 3-4 cm deep. The peat helps keep the soil fluffy and its acidity prevents mold from growing. 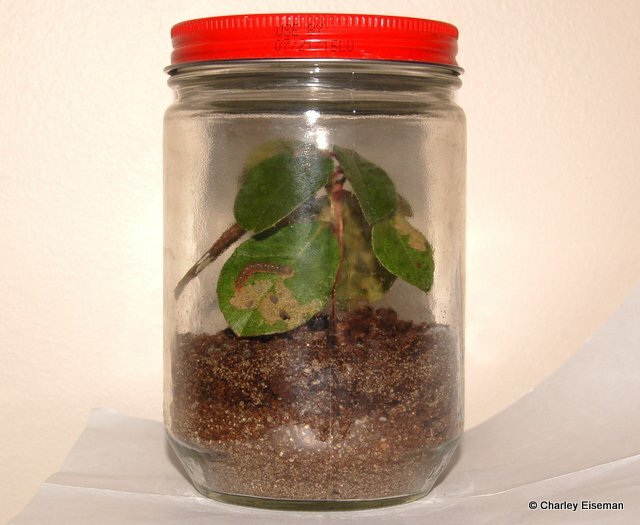 I normally wait until the larvae are mature and wandering around in their original rearing vials before transferring them to a jar of soil, but if I won?t be able to check regularly because of traveling, etc., I put the leaves or galls on top of the soil in the jar, then remove them when I see that the larvae have exited. The photo below shows a peanut butter jar containing a noctuid caterpillar feeding on a sprig of wintergreen that I've "planted" in the peat/sand mixture. These caterpillars take a few months to become full-grown, and I add fresh sprigs of wintergreen as needed. They burrow into the soil when they?re finished feeding and emerge as adult moths about two months later. I take the lids off of the soil jars and put them in Ziploc bags so I can see when adults have emerged. This method, incidentally, is based on the method Ray Gagn has developed for rearing gall midges. I think he has now switched to using 100% peat. 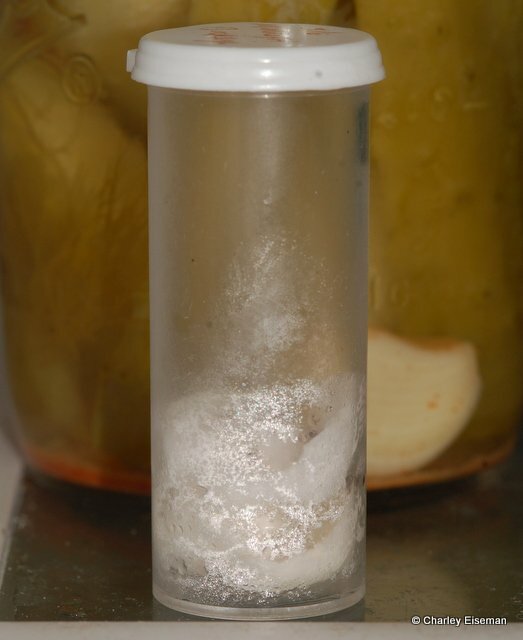 For groups such as eriocraniids that I know won't emerge as adults until the following spring, I keep the lids on the jars until I remove them from winter refrigeration. Lidded jars usually retain their moisture well, but those in plastic bags may need a few squirts of water from an eyedropper every once in a while. Because I'm worried about moths rubbing off their scales in plastic bags, when I have a baby food jar with soil containing eriocraniid larvae, I take the lid off of it and put it in an upside-down peanut butter jar. For the wintergreen moths, I just leave the lid on the peanut butter jar, but have to check under the lid every day because this is likely to be where the moth comes to rest when it emerges. If I'm not sure what an insect's pupation habits are, I put it in a jar of soil with a piece of crumpled-up tissue paper on top of the soil. Almost all insects will either burrow into the soil or make a cocoon in the tissue or on the soil surface. Some sawfly larvae need a chunk of punky wood to burrow into; Dave Smith recommends providing pieces of cork for this purpose. There is an introduced leafminer on honeysuckle, Perittia herrichiella (Elachistidae), that I had a hard time rearing until I learned that it makes a cocoon on the bark of its host plant, camouflaged with bits of bark. So last fall I put some strips of honeysuckle bark in a vial and added the larvae as they emerged from their mines. 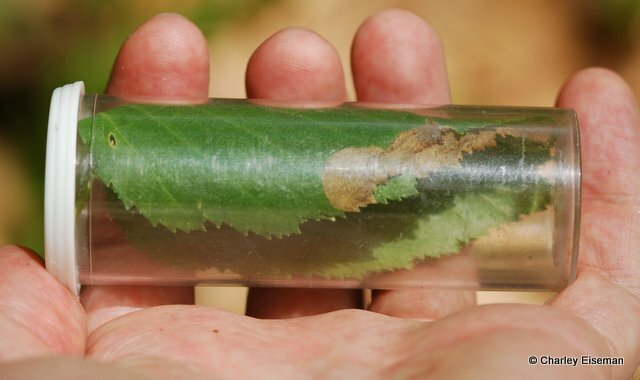 The cocoons were so well camouflaged that the larvae just seemed to disappear after I put them in the new vial, but sure enough this spring they've all emerged as adults. I think this pretty well covers it, but I'll be happy to add further details if anything needs clarification. If anyone has had success with other rearing methods, I'd be interested to hear about them. I've done very little with wood-boring and stem-boring insects, for instance, and obviously some different strategies would be needed for these.